Welcome to Best Deal Photography. We capture beautiful pictures for you to show with pride and treasure forever. We understand you may have never hired a professional photographer and it's not something you do everyday. Hiring a photographer that you can trust and be comfortable with is what it all comes down to, and we would love to meet with you to discuss your requirements and see how we can help. So why wait? Get in contact today. At Best Deal Photography we get great pleasure out of capturing happy & beautiful moments for you to treasure forever. 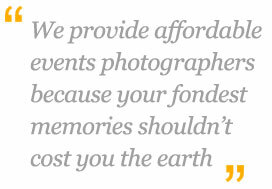 Our love and passion for capturing moments & special occasions in YOUR life gives our photographers great satisfaction joy. Let us tell your story in pictures, we will bring our creativity; capturing that little thing called LOVE!